Video Quality Monitor is a very convenient tool to measure and monitor the video quality perceived by end-users (also called QoE: Quality of Experience). 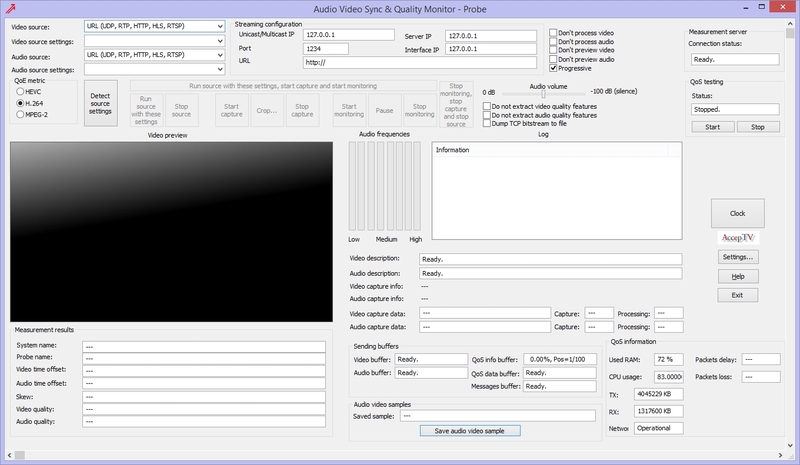 Video Quality Monitor is a video quality measurement software that includes several metrics. For all these metrics, no reference video is required. Therefore Video Quality Monitor enables to measure the perceived video quality at any location in a broadcasting chain. Video Quality Monitor supports several types of video sources : video files, streaming video, video capture device. Video Quality Analyzer is a very powerful tool to precisely measure and analyze the video quality perceived by end-users (also called QoE: Quality of Experience). 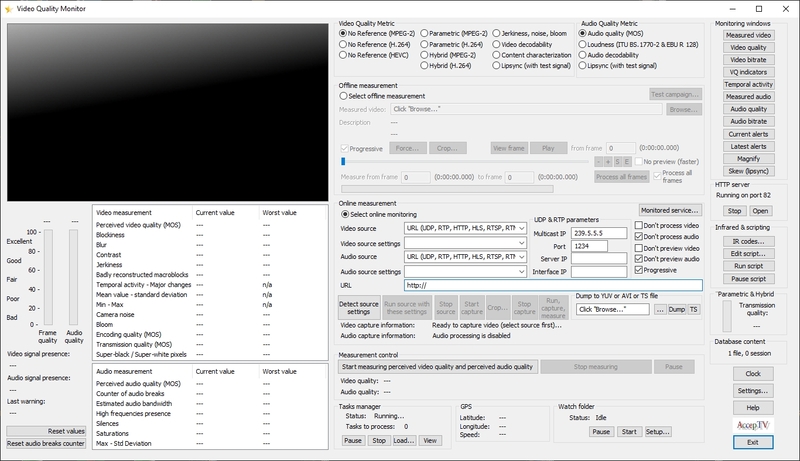 Based on a full reference video quality metric (built on an elaborate human vision model) and on display devices models, Video Quality Analyzer quickly provides very accurate and repeatable measurements of video quality and automatically generates very detailed measurement reports with rich quantitative information on perceived quality and distortions. It also measures the video bitrate and automatically produces "perceived quality vs bitrate" curves (instant bitrate and average bitrate). MPEG Monitor is a unique solution to monitor several MPEG-2 and/or H.264 programs in real time on a single machine. MPEG Monitor is the state-of-the-art software solution to monitor the quality of MPEG-2 and/or MPEG-4/AVC broadcasting. MPEG Monitor catches information from the decoder and injects it in a Human Vision model which outputs quality scores. These scores are then used to trigger alerts (SNMP, email). All measures are saved so that they can be consulted later or remotely. Audio Video Sync & Quality Monitor is a solution to measure and monitor both QoE (audio/video synchronization, audio quality, video quality° and QoS (packets loss, delay, jitter, CPU usage, RAM usage, etc.). Based on audio and video fingerprinting, Audio Video Sync & Quality Monitor is precise and robust. All measured data are saved and can be displayed under the form of statistics or curves in a web interface. Audio Video Sync & Quality Monitor can also save audio video samples when synchronization problems happen. IP QoS Monitor enables to display user-defined maps which represent the network, its probes and the measured QoS parameters. These maps are available in a web browser and are automoatically updated, in real time. IP QoS Tester is a set of three tools (Sender, Receiver and Reflector) that enable to measure several fundamental statistics about the transmission of packets over IP networks: packet delay, jitter, loss, reordering and corruption. 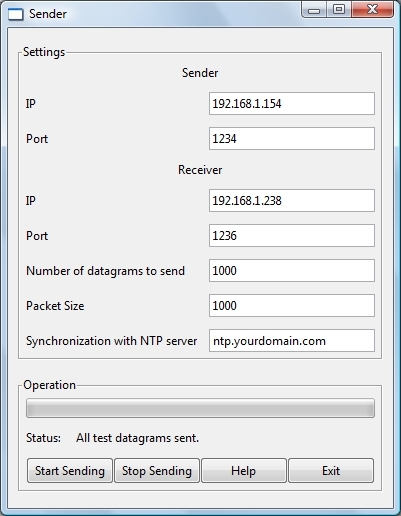 The Sender application sends UDP packets to the Receiver application (identified by its IP address and its user-defined port number). Between the Sender and Receiver applications, the Reflector application can serve as an intermediary by reflecting the data it receives towards another machine. 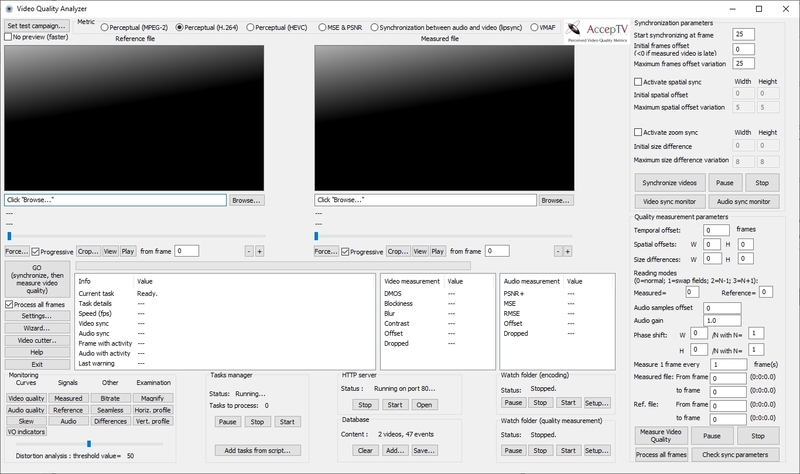 YUV Convert is a video conversion and processing software. Since YUV Convert is certainly the tool which proposes the most important number of processing possibilities for uncompressed YUV files, it is a reference tool for this type of files. YUV Convert can process any video in virtually any codec and any format and save it to uncompressed YUV formats. 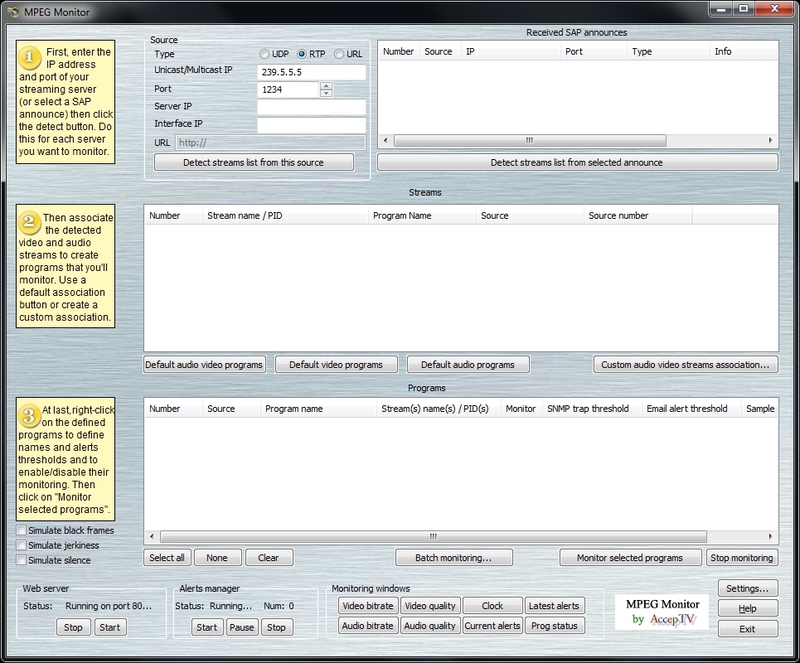 During conversion, several processing techniques can be applied. For example, you can swap U and V components or reverse the frames order. YUV Convert also enables to encapsulate YUV uncompressed frames into AVI files. It also enables to examine the video content at pixel levels by viewing signal profiles or by using a magnifying glass. More, several automation possibilities enable to use YUV Convert from a third-party script or application. 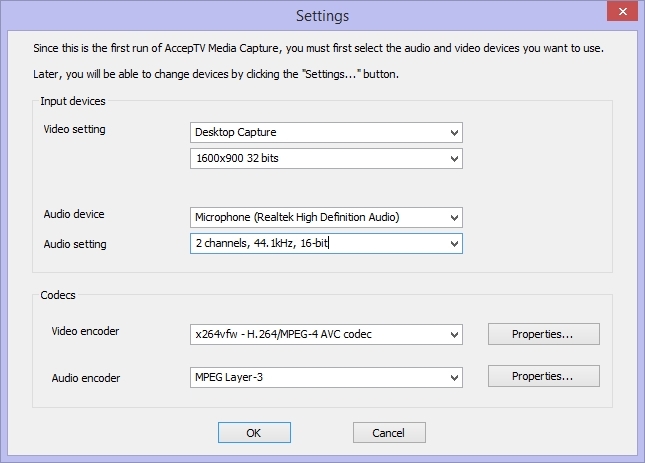 Media Capture is a tool to record videos from the desktop or from capture cards/devices, in compressed or uncompressed format. 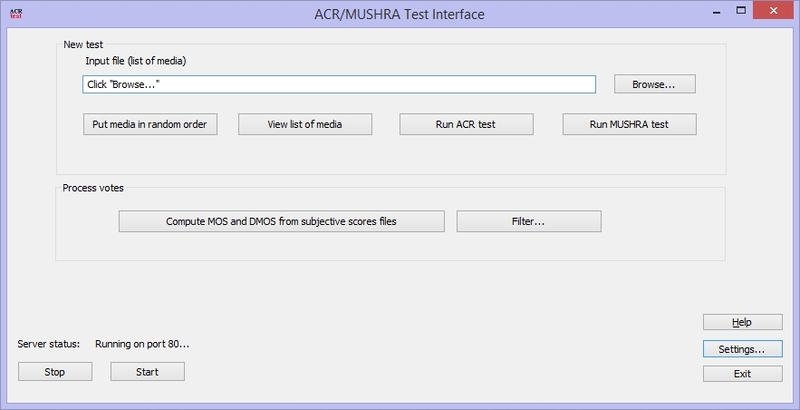 ACR/MUSHRA Test Interface is a useful tool to perform subjective video and/or audio quality testing. ACR/MUSHRA Test Interface enables to show videos to human observers, collect their votes (quality scores), detect and remove incoherent votes and finally compute the subjective quality scores for each video: MOS (Mean Opinion Score) and DMOS (Differential Mean Opinion Score). SVC Test Streams are videos encoded with the Scalable Video Coding profile of H.264, in order to test H.264 STB/decoder interoperability. Any standard-compliant H.264/AVC (Advanced Video Coding) STB/decoder should be able to decode the base layer of an H.264/SVC (Scalable Video Coding) video. Now you can test this interoperability with this set of SVC test streams.